I like food that comes with a good story. Food with a story has been passed down through generations and is pretty much guaranteed to be good. Pasta a la Puttanesca is one of those foods. As the story goes, it was invented by prostitutes in Naples (“puttanas”). Whatever you think of the profession, you will probably agree that the sauce is pretty darn good. It is also very easy to put together. The ingredients are sauteed together quickly and then tossed with pasta. I decided to mix things up a but by using the sauce with quinoa. It made an excellent side dish; I served it with some baked talapia and a salad for a tasty, healthy meal. I also had some leftover for lunch with some goat cheese. Most puttanesca sauce recipes contain garlic, anchovies, peppers, olives and capers. If you like all those ingredients, use them. If not, leave something out or replace it with something you do enjoy. Having a story doesn’t make a recipe un-alterable. Cook the quinoa as per package instructions. As the quinoa is cooking, heat the olive oil in a large pan. Sautee the onions until translucent. Add the garlic and anchovy paste, sautee until you can smell the garlic.Add the spices. Add the red pepper and olives, stir until the red peppers are slightly cooked. Stir in the parley. Mix the sauce with the cooked quinoa. Note: I didn’t add any salt to this recipe because the anchovies and olives add quite a bit. If you are omitting either, taste the sauce to see if it needs any salt. Delicious! I love how it looks and it must taste fantastic with all the wonderful flavors! I love puttanesca, this sounds so amazing! The quinoa is genius, great job! Yum! Sounds like a delicious side to just about any meal! Beautiful picture too! Puttanesca is delicious and to put it over quinoa is absolutely inspired. Well done, Lynn! What a wonderful way to use quinoa!! What a lovely idea. I sub quinoa in a lot of my recipes. I love that it such a power house of nutrients. I have not tried this yet and I’m always excited to try something new. Ooh, I love quinoa! I’m going to bookmark this recipe and do something similar…without anchovies..hehe. This looks really good! The anchovies mostly give a salty flavour, but it has more depth than just salt. You could omit them and adjust the seasoning, but I think I would add more spices in that case. Maybe oregano or basil. Hello. I do not have a julienne peleer, as I am not a great fan of culinary gadgets and in plus, I have a small kitchen. Every time I do julienne on my own, using just a kitchen knife. To make zucchini juliennes is not so difficult, but a real nightmare is to slice carrot, or green papaya – awful job. Probably I should buy this gadget, to make my life easier…Long noodles served with zucchini cut into long juliennes is a great idea – not only looks ideal, but it is easier to eat. On the contrary, to eat spaghetti noodles or tagliatelle, with zucchini chopped into cubes is not comfortable at all!Your dish looks beautiful; congratulations! I love your idea of dressing up quinoa with a puttanesca sauce! I love pasta alla puttanesca and I’ve been discovering quinoa lately so this is the right recipe for me! Quite a novel idea using quinoa as a substitute for pasta, and so healthy for you. Definitely saved this recipe. 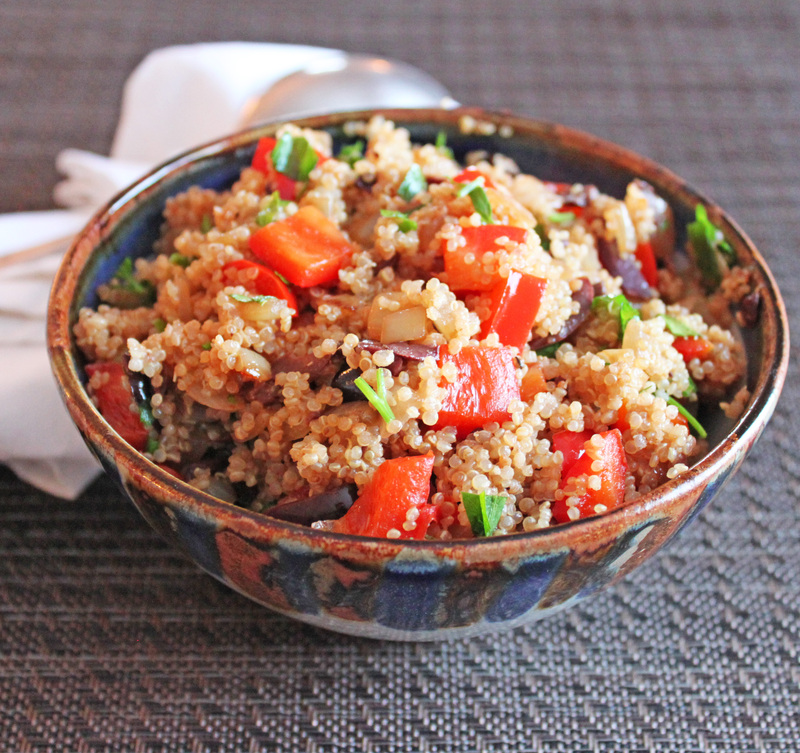 I’m absolutely in love with quinoa – it provides so much more nutritional value than pasta! And that makes this vegetarian very very happy! I like the idea of combining the puttanesca sauce with quinoa! Please don’t be afraid of using anchovies (you really should at least try it once). Even if you think you hate them, they only add a lovely nutty, salty taste to your food, They do NOT have the “furry fish” texture you are probably thinking of…only a smooth paste texture that melts into your food.